Maternity BeltRelieves pain in back, legs and abdomen. With our expertise and trustworthiness, we are engaged in offering an optimum quality range of Maternity Belt. - No backaches - Unique high-back and strong-back feature. - No interference with naturally growing belly. - 2 in 1 - Suitable for Post pregnancy too. We are a pioneer firm with the main focus on offering a top class Maternity Support T to our deemed patrons in recommended time frame. 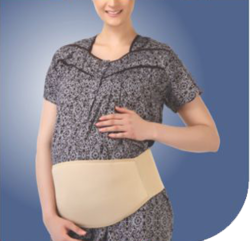 Our company is highly esteemed in providing Maternity Belt. - Gives additional support during pregnancy.